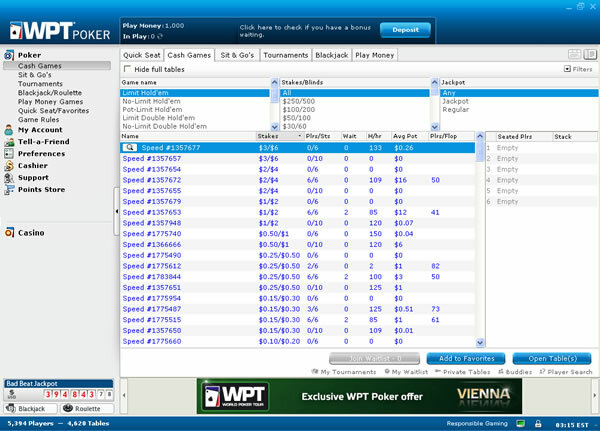 You�ve reached our WPTPoker.com review page; featuring a complete review of one of the most popular online poker rooms. 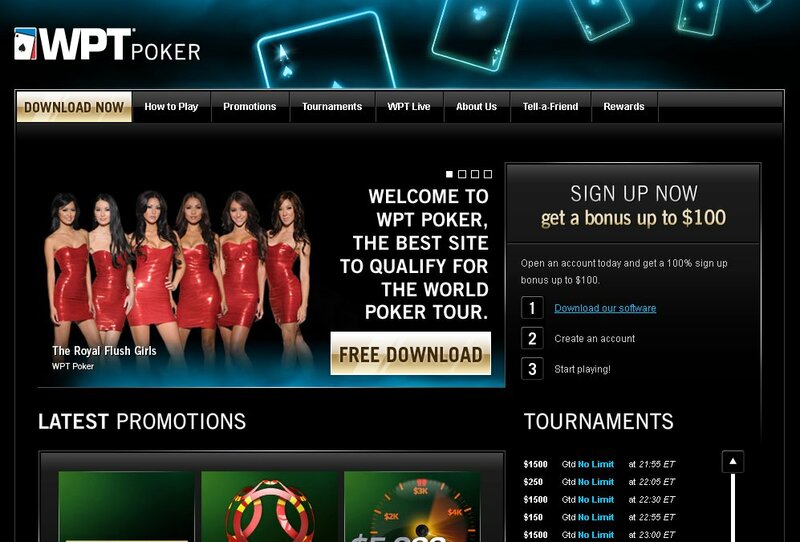 WPT Poker is an established and well known poker room that is a member of the Party Gaming Network. Right now, they are giving away up to $100 in free poker money to all new players! 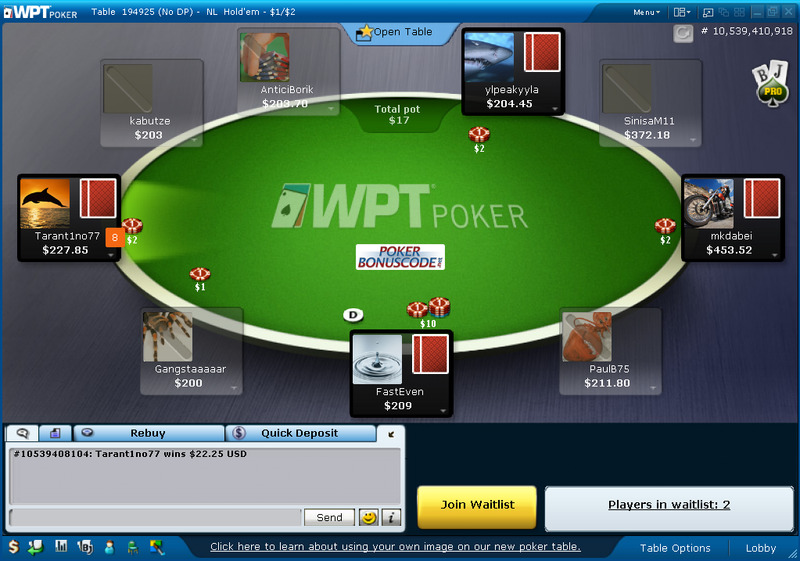 Whether you�ve played online poker or not, you�re probably familiar with WPT Poker. They are one of the most recognizable brands in the poker industry, both offline as well as online, which is why we are proud to recommend WPT Poker to all of our website visitors! Unfortunately they are unable to accept players from the United States, but they do accept virtually all other players! At WPT Poker, you�ll find great games, great bonuses, and extremely fast player payouts! Right now is the perfect time to start playing poker online at WPT Poker because they are currently offering all new players an incredible 100% bonus worth up to $100 in free poker money! To get your free bonus, all you have to do is signup and make your first deposit and you�ll instantly be eligible to start earning your free bonus money! The thing we like most about this free poker bonus is that it is released to your account extremely fast, which gives you an extra incentive to cheer for while you play! WPT Poker attracts players from around the world; all with different levels of experience. We�ve personally played at WPT Poker and we�ve seen some extremely terrible poker players at lower limits as well as some very good players at higher limits. There are definitely some true competitors at this poker room, but you shouldn�t have trouble finding the fish either at WPT Poker. WPT Poker has all of the most popular poker games; including Texas Hold�Em, Omaha, Omaha Hi/Lo, 7 Card Stud, and 7 Card Stud Hi/Lo. All of these games have three variations, which are No Limit, Pot Limit, and Fixed Limit. The most intriguing game that WPT Poker has available is what they call Double Hold�Em. Double Hold�Em is a unique game that we haven�t seen anywhere else and it is very similar to Texas Hold�Em. The main difference between the two games is that you receive three hole cards in Double Hold�Em as opposed to two cards in Texas Hold�Em. After the flop is dealt and before the betting begins, you must commit one of your hole cards as your point card. From then on, you must use your point card and one of your remaining hole cards to complete your hand. This is definitely a very unique game, but it�s also a ton of fun, so we encourage you to try it today at WPT Poker if you haven�t played it before! The thing we like most about WPT Poker is that all of their game variations are available as cash games as well as in tournament play. They are also available at a wide range of limits, so you shouldn�t have any problems finding a cash game or tournament that fits your budget! And speaking of tournaments, you�ll be happy to hear that they have a large number of tournaments for you to choose from! Their two main types of tournaments are sit �n� go tournaments and scheduled tournaments. Sit �n� go tournaments are generally single table tournaments that begin whenever a full table of players have registered to play. Scheduled tournaments on the other hand begin at a set time and they can accommodate a large number of players at once. Both tournament variations are fun to play, so we�re sure you�ll have no trouble finding some tournaments that interest you! As we mentioned above WPT Poker is a proud member of the Party Gaming Network. This means that they use Party Gaming Software to power all of their online poker games. The great thing about Party Gaming is that they are true pioneers in the online poker industry, which means that they have years of experience that they can use to develop their poker software so that they can offer players a state-of-the-art experience. Party Gaming is one of the oldest software providers in the online poker industry and over the years they have impressed more poker players than virtually all other software providers. One thing that we really like about WPT Poker�s software is that it gives you the ability to take note son your competition, which can help lead to an increase in your winning percentage! Navigation is a vital part of playing online poker, which is why we are thrilled to inform you that WPT Poker has one of the best navigational systems that we�ve come across in quite some time! At WPT Poker, you can do just about everything with a single click of your mouse; including making a deposit, initiating a withdrawal, claiming a bonus, and much more! You can also customize their poker software using a wide range of criteria, which can help you navigate your way around more easily and find your favorite games more quickly at WPT Poker! If you�re ready to start playing poker online at WPT Poker, now is the perfect time, because you can get a 100% bonus of up to $100 in free poker money when you make your first deposit! You can make your initial deposit using a wide variety of payment methods; including credit cards, Kalixa, EntroPay, PayPal, Neteller, Skrill by Moneybookers, Ukash, PaySafeCard, Bank Transfer, Wire Transfer, Clickandbuy, and Western Union. Plus, if you have any trouble making your deposit, they have support staff available 24/7 to assist you! So head over to WPT Poker today to make your first deposit and get your free poker bonus!